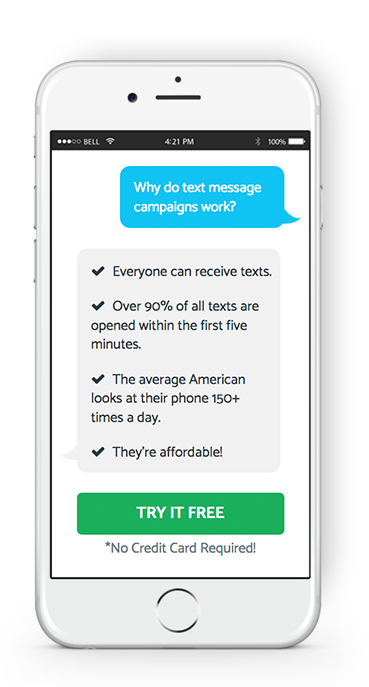 99% of text messages are read within 5 minutes. Bulletins, email newsletters, phone trees; you’ve tried them all. Bottom line? Core communication at your church is suffering. As a result, attendance is starting to dwindle, and that’s the last thing you want. If people don’t receive information about service changes or upcoming events, they won’t participate. Lack of participation means just one thing: your church might not have a future. You’ve tried a bunch of old school communication methods. You email out a weekly newsletter, you stick paper bulletins in mail cubbies, you’ve even made a phone tree for weekly prayer requests. This is why we’ve partnered with SlickText to provide you with an easy to implement solution that will help you stay connected with your church. You can try it out for free, or if you’re ready to get going, just use the promo code LEADERSHIP to get 15% off your first month. Help your members grow spiritually. Fire out weekly devotionals or inspiring texts that encourage people to stay on the right path. Prioritize member safety with SlickText. Instantly fire out any sort of urgent communication. This will ensure everyone keeps safe and stays in the know. Small groups are important. They help church members connect on a more personal level. Remind all potential attendees of an upcoming group or event with a simple text message. Send out quick reminders to parents about upcoming children’s ministry events, volunteer opportunities, and VBS or camp details. Email and social media just wasn’t getting the job done, so for us, Slicktext has been a game changer. The service has proven to be reliable, fast, and easy-to-use, providing us with higher engagement in nearly every aspect of our church ministry. I just switched from one of SlickText competitors and had no idea that the difference in features, ease of use, and customer care would be so much better. It’s not even a comparison. SlickText provides an easy way to send notifications about our events. It helps eliminate those annoying flyers that most people just toss aside. It’s really simple to use and makes it easier to reach people in their busy lives! It all starts with a keyword. A keyword is a word, phrase, or acronym that represents your church or ministry. When members want to stay in the loop, they text this unique keyword to a short code. A short code is a 5 or 6 digit phone number. This is the first message your visitors and members will receive after opting in to your list. Thank them for joining, and include any pertinent information or perhaps an encouraging word. With text messaging for churches, you want to always focus on one thing: strengthening core communication. Remind members of changes and cancellations, upcoming events, and inspiring devotionals. SlickText is the texting service that we personally use at LifeWay Leadership for our events and with all of our podcasts. You can try it out for free, or if you’re ready to get going, just use the promo code LEADERSHIP to get 15% off your first month.